For dull and tired skin that seeks a burst of radiance. Your skin will be Bright and Glowing in 10 minutes. Avoid the eye contour and lips. 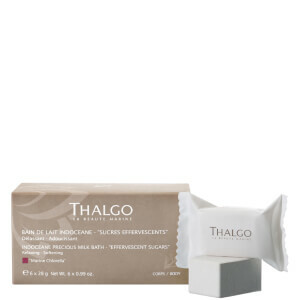 I have used Thalgo for 2 decades LOVE IT! I am now in my early 50's as the skin has changed I have found that the products have been here to accomplish my needs. This masque is new and is as good if not better than the masque I used prior being Melt AwayMask 50ml. Skin feels like velvet use after cleansing and leave on for the full 10 min. Small enough to pop in travel bag and great to use before bed .... drink loads of water a great 24 hour moisteriser such as Thalgo and you will we DELIGHTED!!!!!!!!!!!!!! I have used Thalgo for 2 decades LOVE IT! I am now in my early 50's as the skin has changed I have found that the products have been here to accomplish my needs. This masque is new and is as good if not better than the masque I used prior being Melt AwayMask 50ml. Skin feels like velvet use after cleansing and leave on for the full 10 min. Small enough to pop in travel bag and great to use before bed .... drink loads of water a great 24 hour moisteriser such as Thalgo and you will we DELIGHTED!